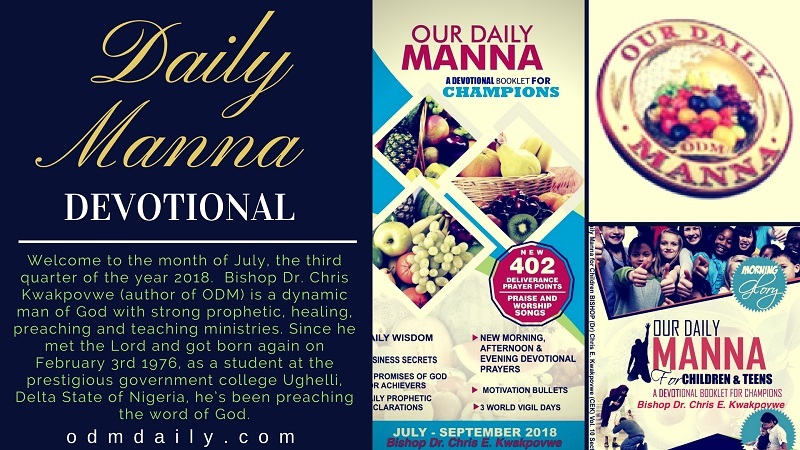 Our Daily Manna 16 November 2018 – VIGIL DAY: I SHALL NOT LABOUR IN MY ENEMY’S VINEYARD! TOPIC: VIGIL DAY: I SHALL NOT LABOUR IN MY ENEMY’S VINEYARD! The following are the steps involved in any SATANIC ATTACK. 1. They put OUT HIS EYES! When enemies want to rubbish your destiny, one of the FRONTLINE ARROWS they will send is to PUT OUT YOUR EYES! That means you become BLIND to where you are going in life and ministry! Our Daily Manna 16 November 2018 – VIGIL DAY: I SHALL NOT LABOUR IN MY ENEMY’S VINEYARD! Blindness here means CONFUSION, DISCOURAGEMENT and DOUBT! Each time you are CONFUSED about where you are going or each time you become depressed about your goals, then an enemy is about to take out your eyes – SATANIC ARROW OF BLINDNESS! 2. They brought him DOWN TO GAZA! Down! After CONFUSION and DEPRESSION, DOWNWARDNESS and STAGNATION becomes the journey direction! Note: HE MADE THEM SPORT! He made them to laugh! He became a COMEDIAN BY FORCE! Oh, destiny wasters! It also means ENTERTAINED his enemies! He became their source of celebration and amusement! Our Daily Manna 16 November 2018 – VIGIL DAY: I SHALL NOT LABOUR IN MY ENEMY’S VINEYARD! Arise tonight 12am-1am and join millions of ODM users worldwide to declare your stand against satanic kingdoms: “MY LIFE AND MINISTRY SHALL NOT ENTERTAIN MY ENEMIES!” MY life, family and ministry shall not LABOUR IN THE VINEYARD OF MY HATERS in Jesus name!” Pray now and pray 12am – 1am tonight! PRAYER POINTS: Take any song of power! 2. I decree that from this day and as 2018 ends, I SHALL NOT SERVE MY ENEMIES in Jesus name (Pray it seriously now and 12am). 3. MY life, family and ministry shall not LABOUR IN THE VINEYARD OF MY HATERS in Jesus name! Our Daily Manna 16 November 2018 – VIGIL DAY: I SHALL NOT LABOUR IN MY ENEMY’S VINEYARD! 5. Lord, let my HAIR grow again! Let my delayed GLORY appears again! Lord, turn the joy and celebration of my enemies to GLOOM/SHAME in Jesus name (Pray it now and 12am).